Garden incinerators & Fire Pits are happy to offer the fantastic Fire Pit Table Drinks Cooler. With so many available these days, it is great to have a name you can recognise. The Fire Pit Table Drinks Cooler is certainly that and will be a superb buy. For this price, the Fire Pit Table Drinks Cooler is highly respected and is a popular choice with most people. Hampton have added some nice touches and this equals great value. 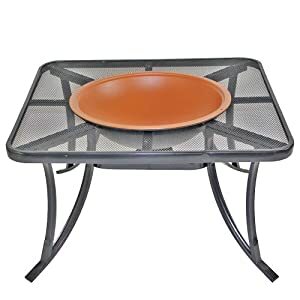 The metal fire pit table is 880mm square with mesh top. The central 480mm diameter fire basket has a spark guard and poker. 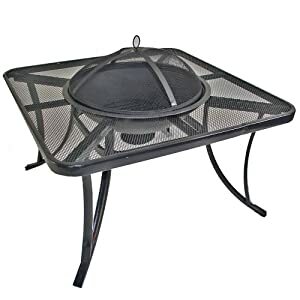 The fire basket can be removed and replaced with a separate liner which can be used as a drinks cooler, making this fire pit table suitable for cool evenings as well as warm summer days. As with all fire pits, heat will affect the finish of both fire basket & spark guard. A coat of fire resistant spray paint will rectify the problem. Mesh table top - therefore no glass to break!